This sharp mild custom 1964 Avanti belongs to Richard Morris of Renton, Washington. If you look close, you can spot several custom upgrades including fog lamps, split rear bumpers, brake lights in place of the original backup lights, all new Stewart-Warner Stage II gauges, wood steering wheel, etc. 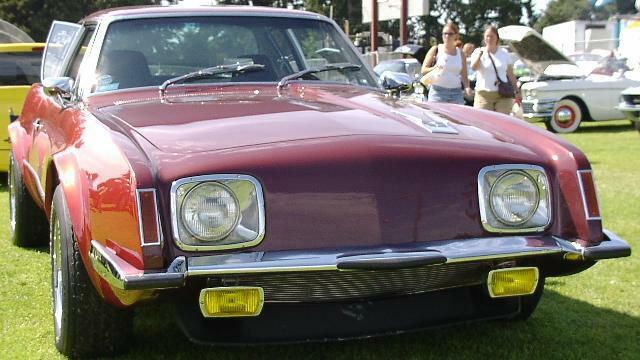 The original owner of this fine car was Virgil Rice, an early and long time Studebaker Drivers Club (SDC) and Avanti Owners Association International (AOAI) member who wrote many technical articles. The car passed through two other owners before Richard purchased it in early 2002 with only 14,000 miles on the odometer. Prior to Richard acquiring the car, it sat under wraps in a warehouse for 20 years. 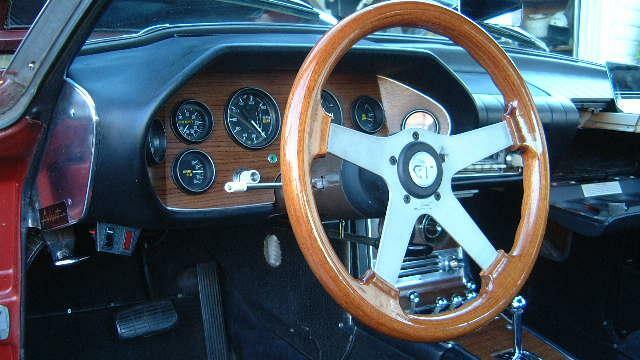 Richard's Avanti also has quick turn steering arms and is beautifully dressed out under the hood. 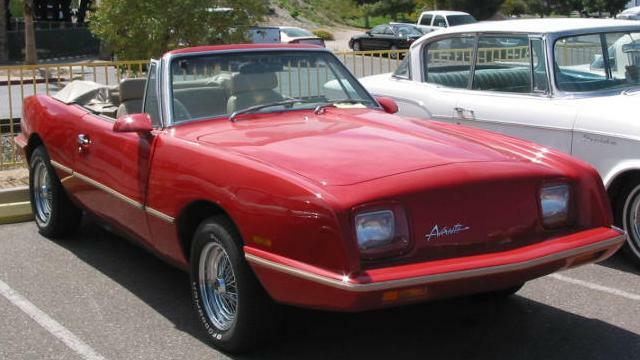 Since we are on an Avanti theme, here is a very nice Avanti convertible. Not many of these were built. Photo taken by Bill Junge at a recent Studebaker-Packard Show in Laughlin, Nevada. The 1959 Lark Hardtop parked next to it is a dead ringer for the car I drove while in college in the 1960's. Another photo from the Laughlin, Nevada Studebaker-Packard Show. 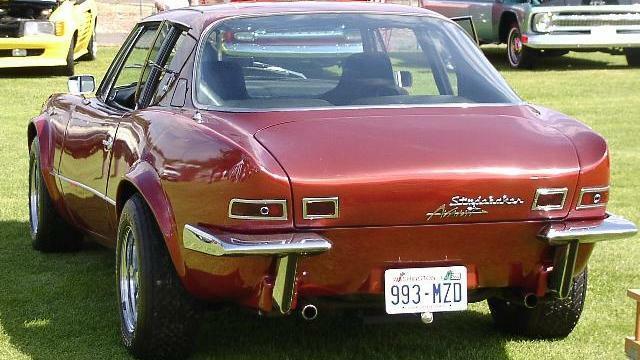 Rear fender skirts as fitted to this Lark were made by the Foxcraft Company. Foxcraft made accessory skirts for many U.S. and some foreign cars in the 1950's and 1960's. While Foxcraft is long out of business, some of the more poular Foxcraft skirts have been reproduced from the original patterns. Replacement rubber and reproduction hardware are also available for many Foxcraft skirts. 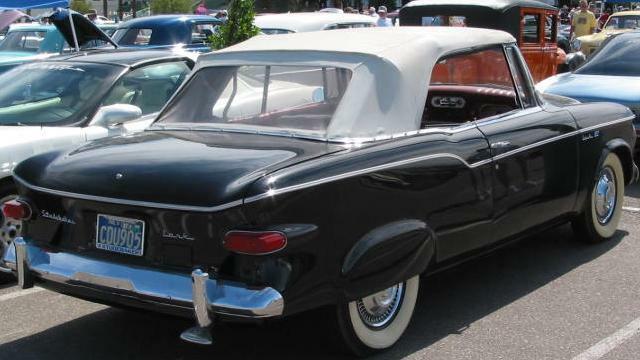 As far as I can tell, Foxcraft made rear skirts to fit 1953 through 1955 Studebakers, 1956 and up Studebaker Hawks, and 1959 through 1961 Studebaker Larks. Factory skirts were available for 1947 through 1952 Studebakers. 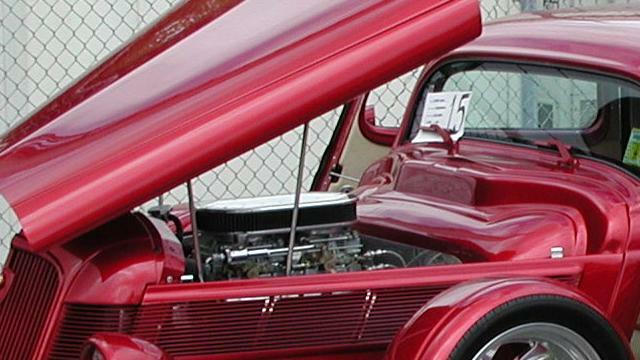 Foxcraft filled the need when the car manufacturers stopped making factory skirts. I had a pair of these skirts on the 1960 Lark Regal Sedan that I owned prior to my second 1957 Silver Hawk. 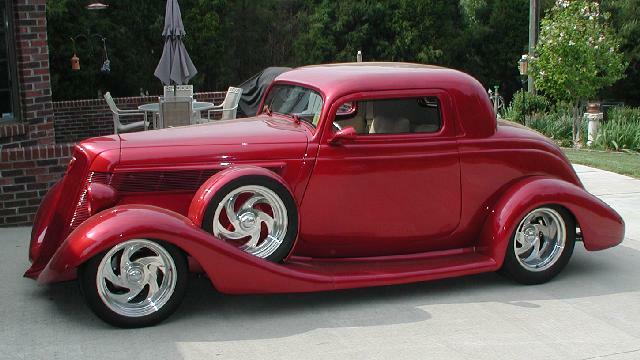 This outstanding 1935 Studebaker Dictator Coupe Street Rod is owned by Walt Sebastian of Thomasville, North Carolina. Power comes from a punched Chevy 454 V-8 topped by a Weiand 671 blower. The beautiful paint job is Dupont Mustang Red. What a great ride! Studebaker dropped the "Dictator" name in 1938 as not being appropriate in the era of Adolf Hitler and Benito Mussolini. 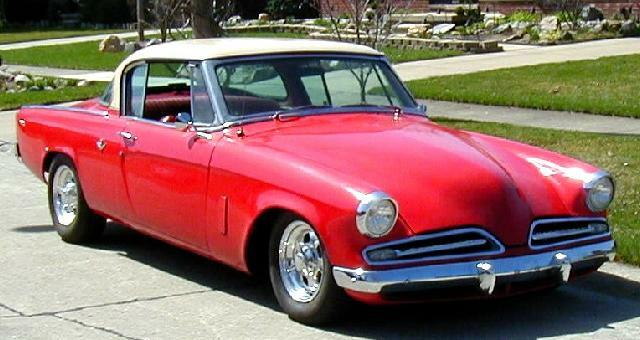 At least Studebaker did not bring out a "Commissar" or "Comrade" model in the 1950's or 1960's. 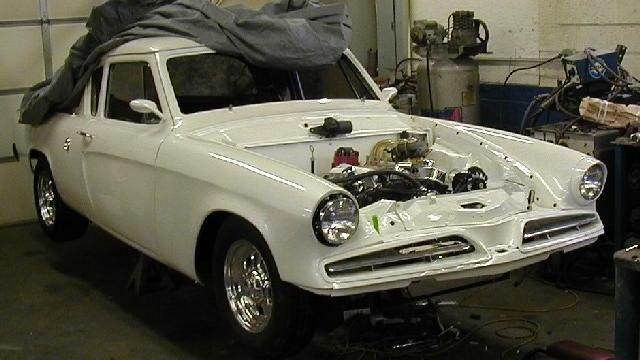 Since 1957 and 1958 Studebaker based Packards are few and far between, I am including this picture here and will add it to the Packard Connection section in the Stude Stuff area. This car was for sale some time ago. I want to think that it was located in California. Does anyone know who bought it or who owns it? Bill Junge has sent along a series of pictures taken in an auto graveyard on an Arizona Indian Reservation. Unfortunately, the cars are not for sale. The two pictures featured this month show a pair of really trashed Starlight Coupes and a rare 1952 Starliner Hardtop in relatively good condition. I'll continue this series with the next few updates. Bill has his own web site called Bullet Nose Paradise which is dedicated to 1950 and 1951 Bullet nose Studebakers. Thanks again to Bill for helping to keep this page in new material. This 1954 Starlight Coupe is being built by Bob Ashlock for Wally Milewski of Livonia, Michigan. Bob's sharp 1953 Starliner Hardtop was on this page last month. 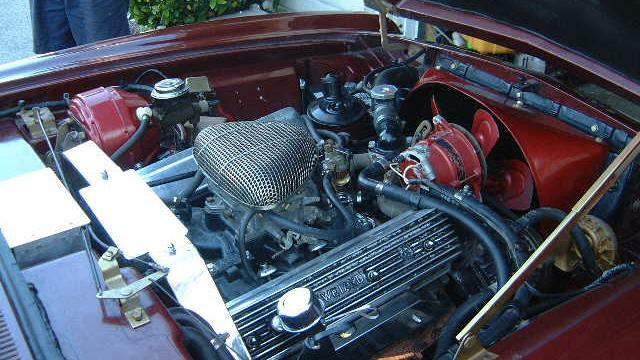 What you see under the hood of Wally's Stalight is a 383 Chevy Stroker V-8 with a GM 700R4 transmission and 9" Ford rear. The rear half of frame has been narrowed 4 1/2" to allow for wider tires. Hopefully we will get to see the finished product. The feature toy this month is an AMT 1954 Studebaker Starlight Coupe promotional model. It seemed an appropriate choice to go with the project car above. This example sold on eBay a while back for a very reasonable price of $49.50. As with other AMT promotional models of this period, it is 1:25 scale with a plastic body, plastic windows, no interior, metal base, and friction motor. This model was also issued in red with a black roof. More toy Studes can be found in the Stude Stuff area of this page and on my Studebaker Toys Home Page.